Irresistible Soft Touch All Day Long! Being a mom of two boys, I am always on the go. With a busy lifestyle we knows that water is important. It is a well-known fact that drinking 8 to 10 glasses of water a day ensures our bodies get enough water to function. But not many are aware that drinking all water alone would not be adequate to boost the hydration of skin. Dehydrated skin can cause skin to look dull and may lead to other skin problems like itchiness and sensitivity. Many women, either housewives having to deal with daily washing or exposure to air-conditioned environment daily, will tend to have dry skin. This is where hand and body lotion can keep skin hydrated, but may require re-application a few times a day to provide effective moisture all day long. Having a busy lifestyle didn't stop me from doing things I love. Now sharing with you about the new ENCHANTEUR 24H Moist Perfumed Body Lotion is specially formulated with Rose Water, White Lily Extract and Pure Olive Oil to offer the busy ladies a lotion that will keep their skin moisturized, youthful and glowing all day long with just one application a day. Rose Water is a well-kwon ingredient which nourishes and hydrates skin. White Lily Extract is rich in amino acids and minerals while Pure Olive Oil is a long trusted ingredient to maintain beautiful skin. The combination of these three amazing natural ingredients, work wonders to penetrate deeply into the skin to nurture, moisturize and nourish the skin to ensure hands and body stay soft, smooth and youthful! It is clinically proven that with a single application of ENCHANTEUR 24H Moist Perfumed Body Lotion, skin enjoys immediate moisturization and hydration for up to 24 hours. It delivers luxurious moisture providing a comfortable texture to the skin. ENCHANTEUR 24H Moist Perfumed Body Lotion’s aqua based formulation, does not leave an oily and sticky feeling to your hand and body. 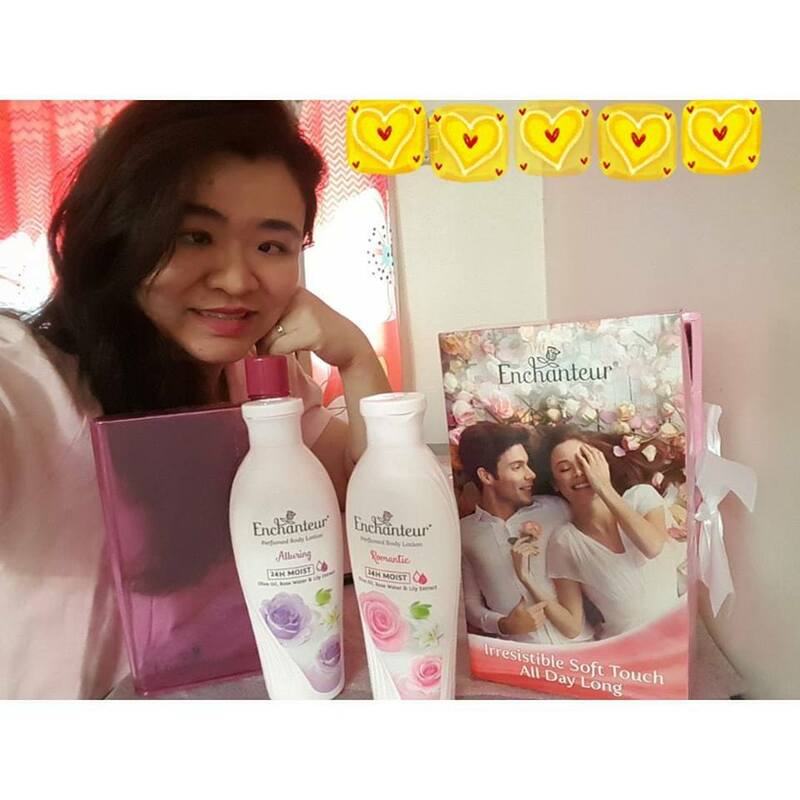 As a connoisseur of fragranced personal care products, ENCHANTEUR 24H Moist Perfumed Body Lotion is also infused with ENCHANTEUR’s French- inspired fine fragrances to help ignite and rekindle romance. ENCHANTEUR 24H Moist Perfumed Body Lotion keeps your hand & body skin healthy and silky smooth, while the lingering with romantic scent of ENCHANTEUR, makes you so irresistible. 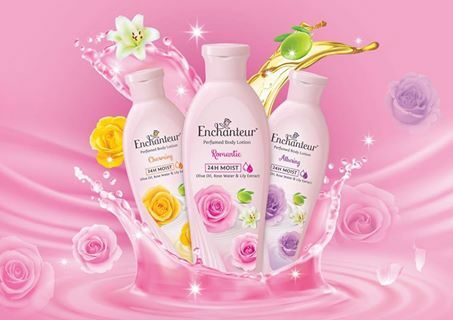 New ENCHANTEUR 24H Moist Perfumed Body Lotion Range comes with 3 variants: Charming, Romantic and Alluring which keeps your skin soft and smooth with hydration up to 24 hours and smell good all day long. • The fragrance which captures the essence of sophistication and chic femininity opens with an exotic mix of Rose and Muguet that’s embraced by Citrus and Aldehydes. It then undergoes a subtle change as the base notes of Musk and Cedarwood become more apparent to perfectly complement your inner style. • A scent which bears the joyous burst of zesty Mandarin with lively, green crisp of Violet and Galbanum that signify the beginning of a wonderful love. Just like true love that grows deeper, ROMANTIC blossoms beautifully with Bulgarian Roses and White Jasmine mingled with delicate scent of Mimosa and Orange Flower. Lingering warm Sandalwood and Vanilla wrap up this lovely concoction that puts romance in the air. • An exotic, seductive fragrance that exudes a sweet mysterious aura. It blends fruity notes of Bergamot and Passion fruit, dissolving into an intoxicating bouquet of Rose and Iris, and warmed by rich Vanilla, Musk and Vetiver – thereby concocting a bold scent that’s one of a kind. I like the ENCHANTEUR 24H Moist Perfumed Body Lotion, they are suitable for me and didn't make me feel any uneasy and it is not sticky on skin after use. It can be a nice gift for loved ones or yourself. The affordable way that working women can take care and pamper themselves, New ENCHANTEUR 24H Moist Perfumed Body Lotion Range retails at RM11.90 (including 6% GST) per bottle of 220ml and is available at all major supermarkets, hypermarkets and pharmacies. For more information about ENCHANTEUR, please log on to www.enchanteur.com.my or check out ENCHANTEUR’s Facebook page at www.facebook.com/EnchanteurMY. Busy mom life of me, I also took time to take care of myself. Here's four colorful Shurah Ariana hair shampoo range, they are yellow, pink, blue and yellow. We need to take care of our hair. How do we know which hair shampoo is suitable for us? I am sure we know ourselves better than anyone else. 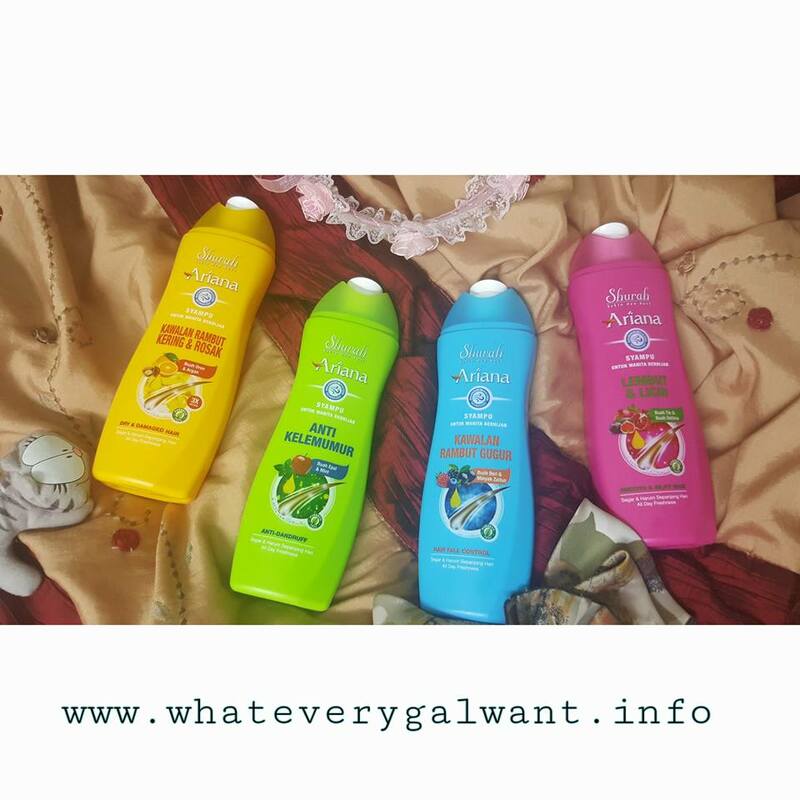 I like this shampoo range as all of it is make with active ingredients and made in Malaysia. Choosing a suitable shampoo for hair is important as we want to have healthy scalp and hair. 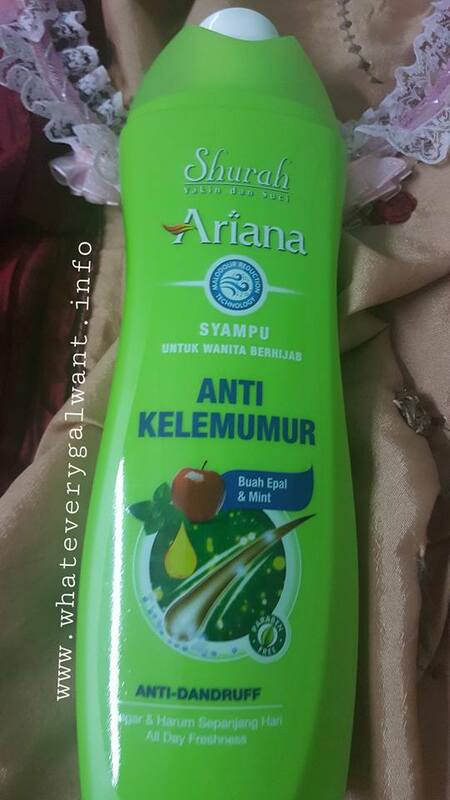 Shurah Ariana formulated with four types of shampoo. This range is suitable for woman who wear hijab. Covering the hair all day long in the weather that is hot and wet, it can makes the head sweat and oily hair. It is not comfortable feeling feeling uneasy. No worry as now we can try out the Shurah Ariana Shampoo. DANDRILYS is one of the active ingredient that is complete the care and more faster than the molekul of anti-dandruff, Zinc pyrithione (ZPT), it helps to reduce the itchiness and control the oilness of scalp. Farnesol and fragrance that combines the technology reducing the smell of fragrance making the hair smell nice for all day long, even if you are wearing a hijab. 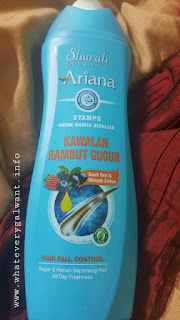 Shurah Ariana Shampoo in blue color bottle, suitable for hair fall control. I like this as I am always afraid of losing too much of hair. We lost about 100 strands of hair daily after wash. The Shurah Ariana Shampoo is formulated with natural active ingredients to prevent irration, odour scalp, and greasy hair. It contains of Micro-Protein to strengthen your hair structure and prevent hair loss. With Olive oil to nourish your scalp for a soft and shiny hair. 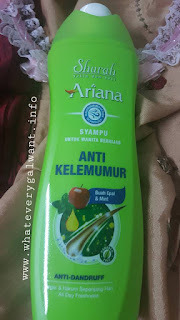 Shurah Airana Shampoo in green color, its Anti-Dandruff Shampoo which is enriched with Octopirox and Mint Extract to solve and prevent your dandruff problems, make you feel clean, fresh & energized. It contains of menthol which makes the scalp and hair feeling fresh all day long. The sweet pink in color Shurah Ariana Shampoo is for smooth and silky hair. It contains of fig and pormegranate. With its active ingredients to prevent irritation, odor scalp, and greasy hair. The ingredients help to moisture, soften and rejunevate your scalp and hair for a more smooth and silky hair. This is suitable for daily use. I'm giving this shampoo to my sister-in-law as she loves hair shampoo that is related to smooth and silky hair. 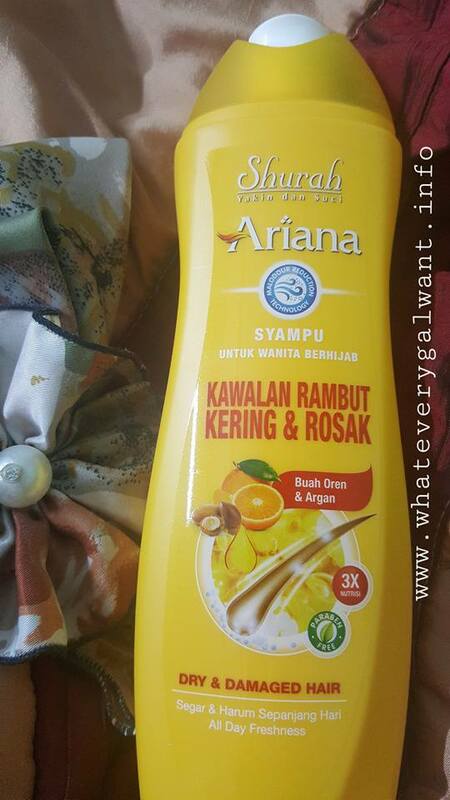 The Shurah Ariana Shampoo in yellow bottle, suitable for dry and damaged hair. I like this bright color bottle which reminds me of daily we are out in the sun. Especially for moms like me daily to fetch son back and also waiting son from school. The shampoo is enriched with Multi-Vitamin like Vitamin A, B5 and E that provides the nutrition for the dry and damaged hair. Vitamin A helps to give moisture, while Vitamin B5 can toughen the roots of the hair to avoid hair fall and damaged. Argan and Jojoba oil to moisture, restore and strengthen your hair to reduce damage and split ends, make your hair shine and easy to manage. Syampu Shurah Ariana is able to find at leading hypermarkets, pharmacies. The range price of RM12.30 for 330 (ml) dan RM7.90 for 170ml. I like the smell of this shampoo, I am sure my mom would like to try them too. It can be a nice gift ideas for loved ones. If you like to know more of Shurah products, visit Facebook of Shurah Malaysia, click on the link. It's a beautiful day to get start, the day before fetching my son from school. I'm invited to attend the launch of Signature HealthLand Sunway Pyramid. 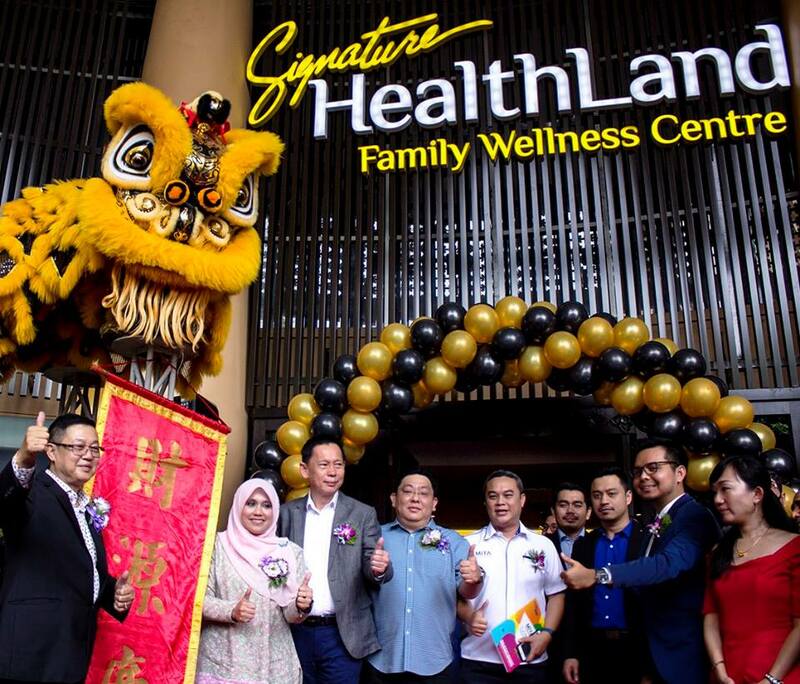 Signature HealthLand Wellness Center, held its official grand opening launch at Sunway Pyramid on Tuesday. Present at the event were 150 invited guests including the Deputy Minister of Tourism and Culture of Malaysia, along with representatives from Sunway Group, Federal Police Force, Majlis Perbandaran Subang Jaya and local media. 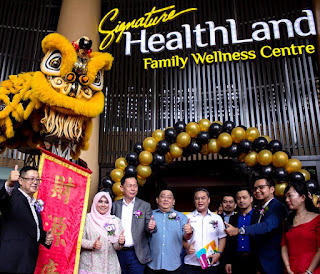 Hailed as Malaysia’s largest family wellness center yet, at full capacity this 18,000 square feet behemoth can serve up to 110 customers at any one time, including full body Thai treatments and foot reflexology. Present at the launch was Deputy Minister of Tourism and Culture of Malaysia, Y.B. Dato’ Mas Ermieyati Binti Samsudin, who commented, “The spa and wellness industry in Malaysia has the potential to be one of the major contributors to drive the country's revenue through cooperation with the tourism sector. We are pleased that HealthLand, with the opening of its 18th outlet, is in line with our vision to double the efforts in development of the spa and tourism industry sector. “This is HealthLand’s first foray into a shopping mall as a family wellness center. We are grateful for the opportunity and look forward to serving Malaysians and tourists from all walks of life,” quoted Mr. Patrick Wee, Chief Marketing Officer of HealthLand Wellness Center. Audiences also witnessed the signing of a Memorandum of Understanding between the parties of HealthLand (Group) Sdn Bhd (represented by Mr. Walter Goh) with the Malaysia Inbound Travel Association (MITA) (represented by En. Adam Kamal) and Max Capital Garden Adventures Sdn Bhd (represented by En. Amirul Hayat), whilst YB Datuk Mas Ermieyati, Datuk Simon Cheong and Mr. H.C. Chan watched on. 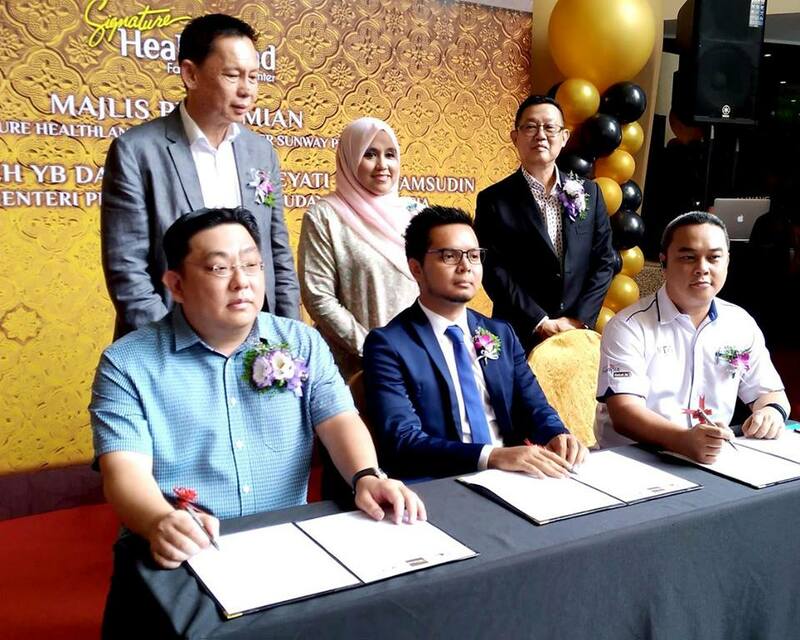 In conjunction with the launch event, audiences also witnessed the signing of a Memorandum of Understanding between the parties of HealthLand (Group) Sdn Bhd with the Malaysia Inbound Travel Association (MITA) and Max Capital Garden Adventures Sdn Bhd. Through this strategic alliance, MITA will promote Signature HealthLand Sunway to both local and overseas tourists. Digital Economy Corporation (MDEC). Ganesh Kumar Bangah, Chairman of E-Commerce Malaysia, a chapter of PIKOM, expressed “We are happy to welcome HealthLand to our esteemed and growing list of merchants that have come on board #MYCYBERSALE this year. Clio Hotel at Sunway Pyramid (OB3 LG 1 - 2). Perfect for men, women, couples and families; a female-only spa area is also available. For more information on HealthLand Wellness Center and its treatments, please visit www.healthland.com.my.